Newly formed alternative rock band THE FELL has released the official music video for its debut single, "Footprints". The clip was filmed in a bomb shelter and biological weapons test site on an active military compound in Poland. "Footprints" will be featured on THE FELL's upcoming album, the release date for which has not yet been announced. 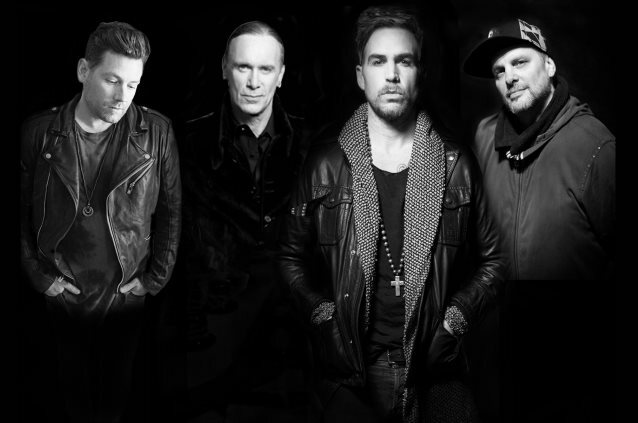 THE FELL is an exciting new band consisting of Toby Rand (RAND, JUKE KARTEL, "Rock Star: Supernova") on vocals, Mike Krompass (producer and session guitar player) on guitar, Randy Cooke (session/touring drummer) on drums, and last but not least, Billy Sheehan (MR. BIG, THE WINERY DOGS) on bass. Says THE FELL in a statement: "THE FELL is a collaboration of musicians who hail from rock 'n' roll upbringings. "We wrote this record with no filter, just the pure experience of playing music around the world. "The four us met through rock 'n' roll, and that is the language we are projecting in this project. "Lyrically, we hope to inspire those in doubt and join those who reap. It’s a new world… a new fight". According to a press release, THE FELL "is not typical of any of [the bandmembers'] past projects, It's a new fresh direction, but uses their influences to create a more modern sound, with heavy guitars, powerful riffs, crushing grooves and huge vocals."